War Bears is a fond tribute to the comics of yesteryear and is, more importantly, a look at the troubled times which plagued smaller publishing houses. In a time when the war effort hurt the local economy, cutting costs and exports made life tougher. Enter Al Zurakowski, an artist struggling to make ends meet. He’s optimistic about the future and thinks achieving the American dream is possible. But hold on, this is Canada! Life is tougher and colder. The reality is that not every publisher struck gold with their comic book creations. He has an idea to make a francophone heroine, Oursonette. I looked at the first issue and loved the world Margaret Atwood and Ken Steacy crafted. The era came alive with Steacy’s artwork. The attention to detail with the drab and the idealized romance was an easy sell. 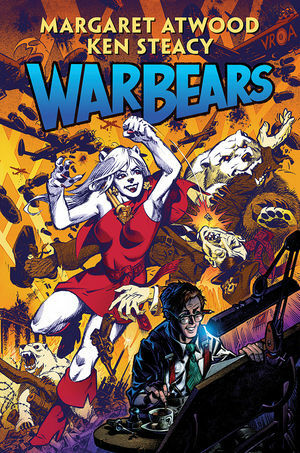 History & The Pulps are Featured in War Bears, A Comic Book Review! With two incredible Canadian talents, Margaret Atwood and Ken Steacy, get together to create a comic book, the industry better pay attention. Published by Dark Horse Comics, War Bears offers two well-meaning stories than one; the main narrative sees Alain Zurakowski as a struggling artist in an era where life is a struggle. The early 20th century was tough for many; not only did a world have to deal with and recover from two World Wars, but also the Depression made getting employed tough. In a dog eat dog world of 1943, this young man manages to get a job at a Toronto-based comic book company (not New York, where the action was at) and has to deal with ornery coworkers. One particular individual steals this kid’s ideas, and the conflict may well run deeper in later issues. The 2017 Camosun Comic Arts Festival (CCAF) is growing and for most, it has the feel of wanting to become bigger. As one vendor told me, it has everything people expect from such a larger show. As an event to spotlight local talent, everyone is here, including showing the next generation is ready. Gareth Gaudin‘s (of Legends Comics & Books and creator of the Perogy Cat) daughters are ready as father and his children have teamed up. Enid Jupiter and Lyra Gotham, the Monster Sisters, is an original comic which shows them facing off against the dark threats hiding in the fair city of Victoria, BC. On April 15th, the third floor of the Young Building at the Lansdowne Campus was completely taken over by local talents (to name a few: Paul Chadwick, Nelson Dewey and Janine Johnston) and the graduates of this year’s Comics & Graphic Novels Program. Photos of some members of this class are offered in the gallery as seen below. Plenty of range can be found, which includes me spotting a few reps from local gaming firms perhaps looking at talent to hire (I saw one person sporting a KANO/APPs shirt) and Codename Entertainment giving out bonus content pass-keys for their latest game Crusaders of the Lost Idols for people walking by. For anyone who lives in the Pacific Northwest, it is common knowledge that Vancouver Island is one of the toughest places to host an event. The lethargy displayed by the fan community backed by decades of failed events, an unhealthy fan club scene and conventions that once shone only to dull and disappear is enough to make any organizer think twice. But one has to admire the sheer bravery of any person who tries to create something wonderful for the local community. Three such people are Evan Hatch, Carson Upton, and Michael Lum creators of GottaCon, a gaming event that lasted a handful of years before closing. Replaced by LANtasy, both are proof that southern Vancouver Island isn’t big enough to support two such events.